Aveda Brilliant Conditioner effectively hydrates and conditions your hair, without drowning it in heavy ingredients. The exclusive formula drenches your hair in plant derived emollients for weightless shine and moisture, whilst antioxidants from oat extracts and other plants protect your hair from environmental damage. It has a mood shifting Pure Fume aroma of certified organic ylang ylang, olibanum, lemon and black pepper. After shampooing your hair with Brilliant Shampoo. 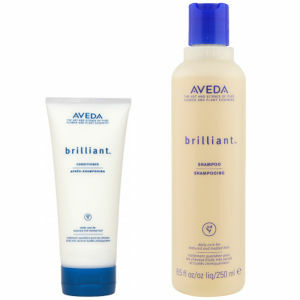 Apply a small amount of Aveda Brilliant Conditioner to your clean, wet hair.